Shake shingles provide a heavily-textured look and tend to contrast well with the appearance of vinyl siding. 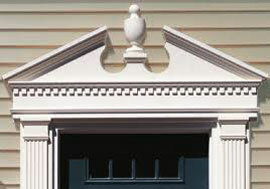 Add them to the gable of your home to help create a feeling of depth and character. Using an accent color is an easy way to make the exterior of your home more unique and eye-catching. 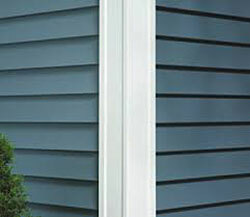 Side the corners of your home’s exterior in a color that complements your siding to help create contrast. There’s a lot of flexibility when selecting an accent color for your corners, but it tends to look especially nice when a lighter paint color is used alongside a darker vinyl siding. Window mantels are the perfect complement to your existing windows and siding. They not only add architectural integrity to your home, but can also make your windows appear larger and more prominent. 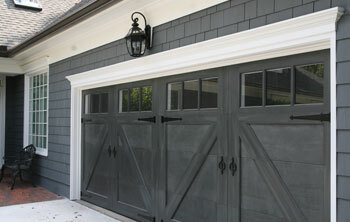 Surround your garage door with a mantel to help dress up your door and give it a richer appearance. A garage door mantel is a great addition to the simplicity of any home’s siding job, but will be especially complementary to homes that have a more rustic or colonial style. Elevate your home’s architecture with an entry door surround system. While there are a number of styles to consider when customizing your entry door area, keep in mind that ornate, detailed elements often play well with vinyl siding because of the contrast between simplicity and complexity. Select an accent color for your home’s shutters. 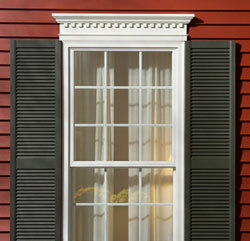 This extra design element will make the colors of your home pop and will accent the appearance of the vinyl siding. 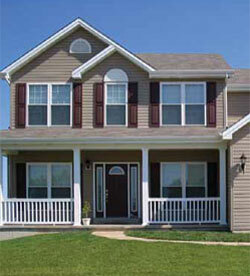 Make sure the color you choose complements your siding, as well as your trim and door colors. 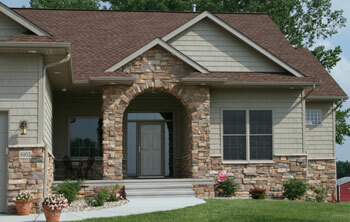 Mix sections of stone in with your vinyl siding to give your home added character. The “rule of three” suggests that too few materials or colors can leave your home looking uninspired, so consider using one of the many styles of stone veneer as an additional accent option to combat monotony. These are just a few of the ways to use accents to make your siding job stand out and increase the curb appeal of your home. 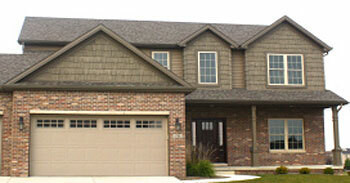 Check out our website for more information on siding products, installation, and replacement.